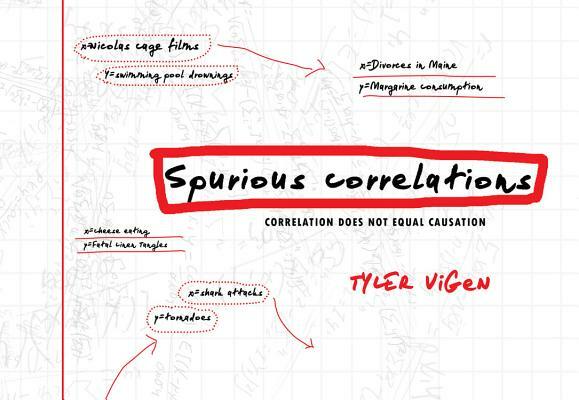 Military intelligence analyst and Harvard Law student Tyler Vigen illustrates the golden rule that "correlation does not equal causation" through hilarious graphs inspired by his viral website. Is there a correlation between Nic Cage films and swimming pool accidents? What about beef consumption and people getting struck by lightning? Absolutely not. But that hasn't stopped millions of people from going to tylervigen.com and asking, "Wait, what?" Vigen has designed software that scours enormous data sets to find unlikely statistical correlations. He began pulling the funniest ones for his website and has since gained millions of views, hundreds of thousands of likes, and tons of media coverage. Subversive and clever, Spurious Correlations is geek humor at its finest, nailing our obsession with data and conspiracy theory. Tyler Vigen is a student at Harvard Law School. He created the Spurious Correlations website during a week before finals, when he probably should have been studying. Prior to attending Harvard, Tyler was trained in visual intelligence collection and analysis by the military.